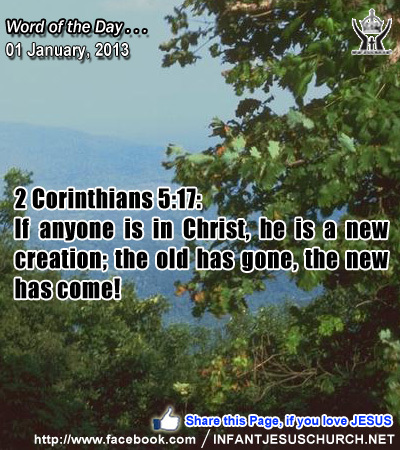 2 Corinthians 5:17: If anyone is in Christ, he is a new creation; the old has gone, the new has come! Heavenly Father, thank you for the New Year and a fresh new start. Please give us wisdom and strength to serve you with integrity and faithfulness in this new year. We pray that your work be done in our life as we offer ourselves, our plans, and our future to you. we pray this through Infant Jesus ourLord. Amen. 16And they went with haste, and found Mary and Joseph, and the babe lying in a manger. 17And when they saw it they made known the saying which had been told them concerning this child; 18and all who heard it wondered at what the shepherds told them. 19But Mary kept all these things, pondering them in her heart. 20And the shepherds returned, glorifying and praising God for all they had heard and seen, as it had been told them. 21And at the end of eight days, when he was circumcised, he was called Jesus, the name given by the angel before he was conceived in the womb. In fulfillment of this precept, Mary's infant child is given the name Jesus (infant Jesus) on the eighth day according to the Jewish tradition. Joseph and Mary gave the name Jesus because that is the name given by God's herald before Jesus was conceived in Mary's womb. This name signifies Jesus' individuality and his mission. The literal Hebrew means the Lord saves. Since God only can forgive sins, it is God who, in Jesus his eternal Son made man will save his people from their sins. In the birth and naming of this child we see the amazing design and plan of God in giving us a Savior who would bring us grace, compassion, and freedom from the power of sin and the fear of death. The name Jesus signifies that the very name of God is there in the person of his Son who became man for our deliverance. Peter the Apostle exclaimed that there is no other name under heaven given along with mortals by which we must be saved. In the name of Jesus demons run away, cripples walk, the blind see, the deaf hear, and the dead are raised. His name is high far above every other name. The name Jesus is at the heart of all Christian prayer. It is through and in Jesus that we pray to the Father in the authority of the Holy Spirit. Many Christians have died by one word on the lips, the name of Jesus. Do we exalt the name of Jesus and pray with self-assurance in his name? Loving Infant Jesus Christ, we praise your name above every other name. For in you we have pardon, mercy, grace and conquest over sin and death. You humbled yourself for my sake and for the sake of all sinners by giving out in our humanity and by dying on the cross. Help us to always praise your holy name and to live for your greater glory.